Back in March young footballers in the Devon Junior Minor League were invited to raise funds for Brain Tumour Research, with the team which raised the most winning a new football strip for one of their teams. Three months on, and the winning team has been revealed – none other than the budding Beckhams of Roborough Youth FC. The club successfully raised £210 for Brain Tumour Research by selling fun, football scratch cards to spectators at its football matches throughout the season. At the Mini Soccer Festival earlier this month, which is one of many Brain Tumour Research fundraising events supported by Santander, a grand total of £2784.14 was raised. The money raised by the bank staff was match funded by the Santander Foundation. 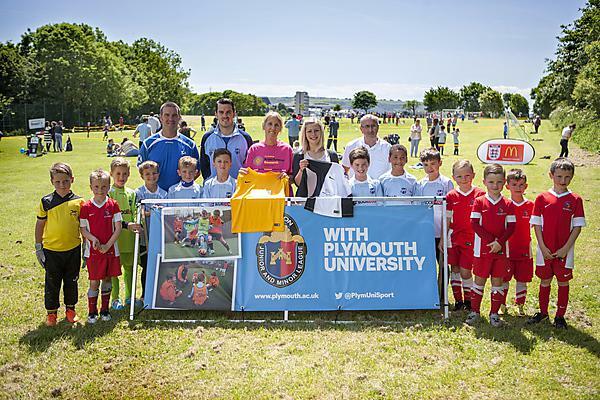 Devon Junior Minor League have chosen Brain Tumour Research as their charity of the year and Santander Plymouth has been fundraising for Brain Tumour Research for the past six months. Brain Tumour Research supports ground breaking and world leading research at Plymouth University, which is home to one of four of the charity’s Research Centres of Excellence. The research team is led by Professor Oliver Hanemann. Based at Plymouth University Peninsula Schools of Medicine and Dentistry, their work is focused on low-grade tumours in teenagers and adults. By identifying and understanding the mechanism that makes a cell become cancerous, the team explores ways in which to halt or reverse that mechanism. A key innovation is fast track: testing new drugs in human primary cell cultures leading to innovative phase 0 trials leading to adaptive phase II/III trials with the potential for making drug therapies available to patients both safely and faster. Brain tumours are the biggest cancer killer for people under the age of 40, and in the South West we have the highest incidence of brain tumours in the UK.